Welcome back! It’s been a while. I’d be happy to just ignore that year-long hiatus, but I’ll be honest: I debated not coming back at all. Blogs aren’t what they were and I miss those good old days. Before social media made everything else feel slow and cumbersome. Before sponsored posts took the authenticity out of everything. And before people were more interested in gaining likes than they were having a discussion or enjoying their lives away from a tiny camera lens. But here I am again, with a new-look site, some new posts and a new ebook - because I miss creating, and writing and sharing. So basically, I’m just going to blog my way - whatever that is! I have things in the works that don’t involve advertising or sponsored posts or lying to you about how fantastic something is because someone sent it to me, because I’m over all that and wish so much it would all go away. And I’m starting with this ebook. It’s free. 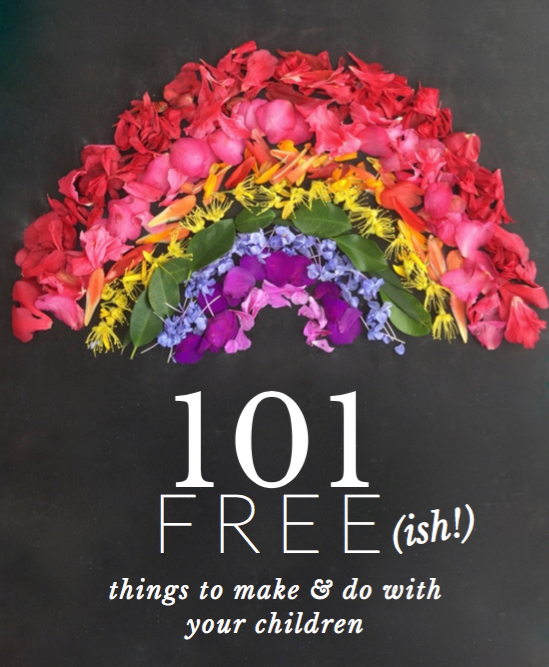 It’s filled with things you can do and make with your kids (or let them do themselves so you can catch a break - are you enjoying the holidays yet?) with materials you can easily access - and mostly for free! Who doesn’t love free?! Some you might recognise from Instagram or this blog; some are new. There is something for almost every age and most involve simple fun, being out and about in nature and just creating something with your own hands and basic materials. It was meant to be ready before the school holidays began, but if you know me at all, you’ll know things always seem to happen when I have a deadline, and things happened. And then I had to work out new programs and platforms and, well, technology and me aren’t the best of friends… But I’m done. I think I’ve worked out how to get it to you in one piece and I hope you like it! If you like what you see in these images and sample pages, enter your details in the form below and a link will be sent to your email address where you can save to your desktop. If you’re already a subscriber (thank you! ), I’ll be sending it to you soon in an email. Don’t forget to check your bulk mail/spam folders as files like this often end up there instead of your inbox. If it just doesn’t seem to get to you (it’s entirely possible! ), just email me and I’ll send it to you direct. And if you try any of the ideas in the ebook, please share on your social media feeds and use the hashtag #happyhomecraft or just tag me @belindagraham - I’d love to see! as soon as I saw it. I got close one day when Annika sat in an upside down umbrella at the cricket but there was a cute penguin missing and she wasn't wearing the right gear so I figured a future Book Week would be the right time. And here we are! I asked Immy if she was keen to wear it in the parade and she was so excited and wanted everything perfect - down to the tiniest detail like a little brown suitcase and a tag hanging from the umbrella handle. No pressure, Immy... Well, it may not be perfect but it turned out pretty cute anyway! I don't normally like buying things with the sole purpose of destroying them but when I realised I had already thrown out my old umbrella that didn't close, I searched for a cheap one - this was a whole $4 so I had no problem cutting a hole in it. Especially after one of the inside arms broke within two minutes of Annika stealing it and walking around the house with it. That's what $4 gets you I guess! Painting umbrella fabric wasn't very successful so I bought some yellow and orange cardboard and cut them up. At first I used double-sided tape to stick them on, but after they came away it was the hot glue gun to the rescue yet again! Measure up the cardboard against the umbrella - you want it in-between the metal parts. Cut to size and hot glue gun into place. Overlap at the centre of the umbrella and continue all around alternating the colours. hide all the joins of the cardboard. Turn the umbrella over and see where you want the legs to go. I used liquid chalk to draw a quick outline and then just cut through the plastic and into the cardboard. Cut the two pieces together for the neatest line. Reinforce the cardboard with some more glue around the edges of the hole. ). Which do you like the most? character!" 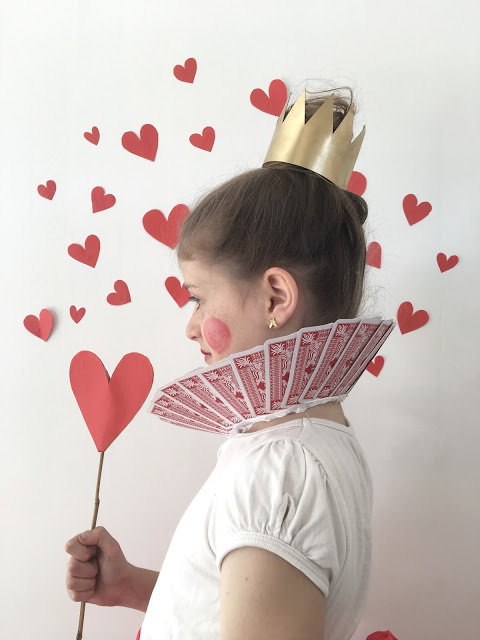 But I chose the Queen of Hearts for a few reasons - one of them because I wanted to finally use the fantastic IKEA Lattjo Queen crinoline and skirt I bought ages ago (which is no longer available by the looks of it). And secondly, because it IS a popular character and I think it's pretty darn easy to make it look fantastic without having to sew anything or buy too much. All I bought for this outfit was a packet of cards and two plastic tablecloths for the skirt from Kmart. A grand total of $7 was spent as I had the rest of the stuff at home already. I realise part of what makes this look good is the puffiness from underneath it - a tutu or frilly skirt should do the trick and if you have a girl, chances are you have one of those lying around your house already! The collar I discovered on Pinterest in various incarnations and is so simple but so effective! Bravo to the clever person who came up with the original idea! Unfold the round tablecloth until it's folded into a quarter, as above. In the pointy corner which is the centre of the tablecloth (the bottom right in this picture), cut across it to create a hole in the middle. Unfold so it looks a little like a white plastic donut! You might need to make adjustments here to make it bigger if you were cautious with your original cut - you'll want to be able to step into the hole and pull it up around your waist with plenty of room to spare. Carefully fold back the edge of the hole so it forms a seam big enough to easily thread the elastic through afterwards. Use your hot glue gun to gently glue the seam in place. Don't leave it on the plastic too long - it will burn a hole in it! But the glue itself does a pretty good job. Continue all the way around back to the beginning but leave a bit of a gap to allow the elastic through. Attach a safety pin to the end of a piece of elastic and thread through the seam gently. Work out what will fit comfortably around your child before tying it off and cutting. The skirt will gather slightly. 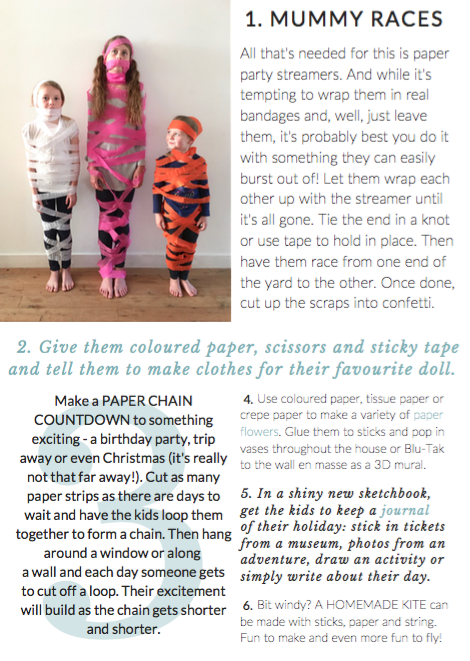 Pop it on your child - they'll be your mannequin for the next few steps. Unfold the red tablecloth and lay it out on the floor. Cut off a strip longways - about 40cm thick and put aside. This will be your ribbon to hide all fake-sewing sins! Wrap the larger piece of the tablecloth around your child, covering the top of the white skirt. Pinch at the meeting place and have your child hold. Stick on the sticky velcro dot to secure. Cut from the velcro dot down along each side on a diagonal, curving at the bottom. Fold the skinnier piece of the red tablecloth you had set aside into a neat strip and wrap around the waist, covering the top of both skirts. Tie into an oversized bow at the back. Cut out paper hearts in various sizes and colours and stick in place on the front of the white skirt that is visible. I'm sure this doesn't actually need a tutorial as it's pretty easy, but here is what I did anyway! Fan out several cards until you have a rainbow! I wanted more than just the number showing so placed them individually in place to create this shape. Once you're happy with the placement, begin gluing them together. Do the back as well for extra strength and neatness (and also to avoid potential paper cuts!) Glue the very edges of the ribbons together where they first meet. Tie around the neck gently - it will naturally sit upright as you tighten and tie off into a bow. A cereal box is my secret source for all things costumes. I once made a Star Wars Clone Trooper costume for Zak out of cereal boxes! They're the perfect stiffness while being thin enough to easily work with. Anyway, I just cut out the zig zag crown, spray painted it gold and glue-gunned it into place. It just sits on top of her bun - no comb; no headband; no bobby pins! Again, a cereal box with glued-on red paper cut into two hearts and glued back-to-back with a bamboo stick sandwiched in-between! Red face paint was painted onto lips in a heart shape with a really fine paintbrush. The same paint was mixed with moisturiser for the rosy cheeks. A red lippy would also work, obviously! We used gold eyeshadow on the eyes too. Layla and I both love how her costume turned out. She originally was going to be the Cheshire Cat and was just going to model this one for me for the blog, but as soon as she put it on she changed her mind! Not sure how she'll go sitting in class with that huge skirt on though! Ha! 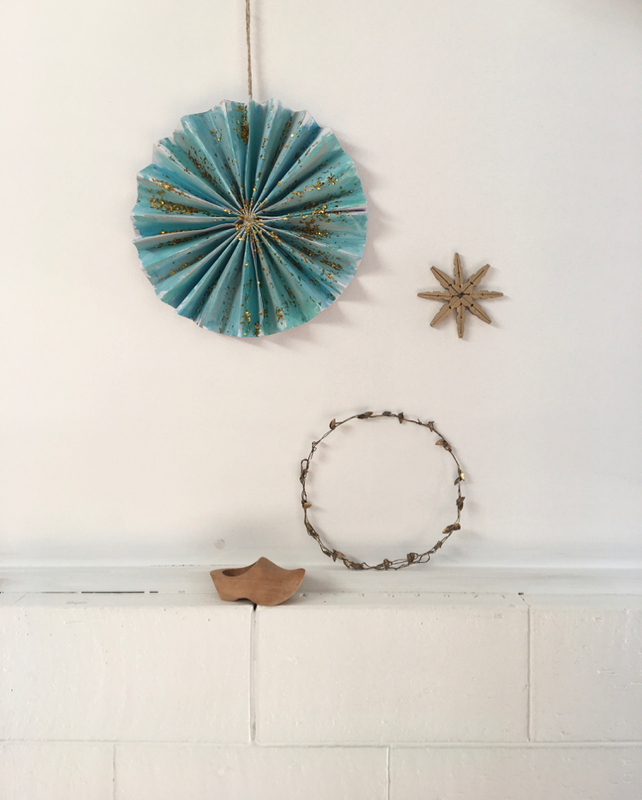 My favourite crafts are the ones where you can use what you have already - or use things from a little hunt and gather around the neighbourhood. Then it's a drawn-out craft with bonus exercise! I was looking at the bow pasta the other day thinking how cute it would look as a little bow tie on a illustration. And so today's craft idea was born! I told Layla what I was thinking and she was in - she went around and picked some flowers and greenery from the garden, thought up her scenario of a ballet dancer and asked me to draw the girl. She then glued on the tutu from flower petals, painted a tree ("an autumn tree") and after changing her mind from rice snow to glitter snow, she then painted an ice rink and drew some ice skates onto her ballet shoes! She thought the couple would look pretty smart with a top hat with a feather and framed with some elbow pasta. I love watching her in creative mode and seeing what she comes up with. We hunted around the craft cupboard for little beads and other sequins and had fun getting creative - I had to make one too! 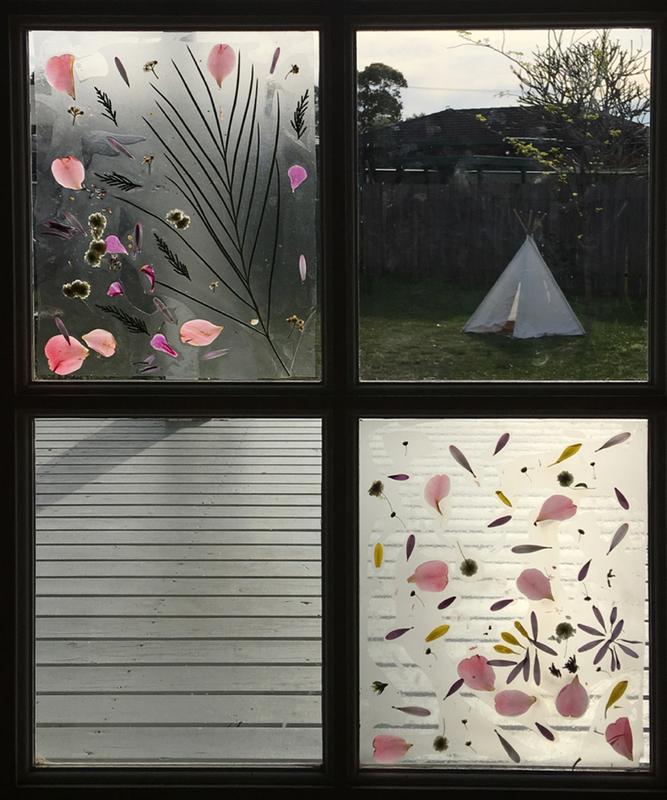 This kind of craft is really only limited by your imagination - so many things in your garden, your pantry and craft cupboard can be used: beads, gum nuts, sticks, tiny stones, foil, confetti, leaves, feathers, sequins, buttons... you get the idea. I think a really small version could be sweet made up as gift tags or a birthday card. And while white or coloured backgrounds would look great too, I can't help but think things stand out a little more on the black cardboard. And happily, the watercolours worked too - although a little less bright than they'd appear on a white background. Suggest a scenario or have your child think something up. Draw the basics - a simple person is easy and they can "dress" them and fill in their surroundings. A house is also a good one. I have this great love of paper plates. I use them for everything. A pile of 50 goes really, really quickly in my house. Aside from parties, they're often folded up into little boxes for mini craft storage or picnic packaging, cut up into gift tags or just used as craft paper - they kids draw on them and cut them up into all sorts of random things - and then we even make good use of the off-cuts for maths homework working out! They're also so brilliant for crafts. I'm running a free kids craft stand at an upcoming fete and decided pretty quickly I'd create some crafts around paper plates. One of them will be these lion masks for the younger kids. We'll most likely shred some newspaper or whatever paper we can get our hands on for the fete, but these shades of tissue paper and tinsel are perfect for a lion's mane. Cut around the base of the paper plate with the scalpel so you have a hole. Using the circle you've just cut out, cut two ears and set aside. Punch a hole on either side of the plate. Thread and tie your elastic to create a mask. Cut your shredded tissue paper and tinsel into smaller pieces so they're not too much longer than the edge of the plate. Mix them up a little for a more "natural" mane! Glue the face of the paper plate and stick the mane in place. Glue the ears in place. Gently cut around the inside of the mask to trim away excess "hair" so it doesn't tickle your child's face! Be careful not to snip through the elastic. Leave to dry in the sun and in the meantime, paint on a nose and some whiskers. Once the glue is dry, pop the mask on your child's head. The plate can be popped outwards to sit nicer on their face. ROAAR!